My high school English teacher said to put a comma in a sentence to indicate a pause. Because of that simple advice, I scored very high on the English part of my college entrance exam. Since then, however, I've learned a few more rules about commas and other punctuation. As a writer, I purchase many grammar books that sit on my shelves as reference material, such as Strunk and White's The Elements of Style. I use it frequently as a quick guide. I'm not a "punctuation stickler" but I run in the race. Look at the title of the pictured book. It looks fine until you realize it describes a panda bear. The joke on the back tells of a panda who "walks into a cafe. He orders a sandwich, eats it, and then draws a gun and fires two shots into the air. " When a waiter asks why, he throws a poorly punctuated wild life manual over his shoulder and says, "I'm a panda" . . . . .Look it up." In the manual the waiter finds a description written as shown on the title of this book. Many may read the phrase and see nothing wrong. 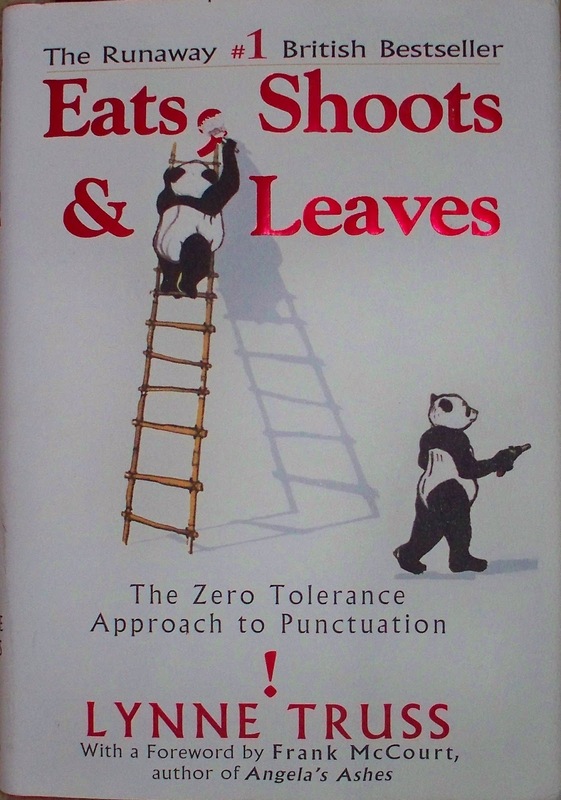 The panda tries to eliminate the problem, a misplaced comma. British editor/writer, Lynne Truss, approaches punctuation through history and her "stickler" attitude. It is a truly funny, fun read. Truss explains that Greek dramatists two thousand years ago, added commas so actors would know when to pause. Thus a modern day slogan explains why cats aren't commas. "A cat has claws at the end of its paws. A comma's a pause at the end of a clause." Truss not only talks about commas. She discusses apostrophes, colons, semicolons, and other punctuation marks. She illustrates their use via humorous stories. Buy, steal, or borrow her book. Learn a thing or two about punctuation and laugh a lot in the process. Read it. You'll like it. Truly a funny story to tell. I would love to see that on a big screen! If you or some of your readers will need help from the https://www.ninjaessays.com/writers/ to write or review the script - don't hesitate to ask professional help/advice. Ninja's door is alway open! ) Good luck!